Bring the salon home with natural style Kiss True Volume Chic Lashes with Revolutionary Kiss Tapered End Lash Technology that delivers real-like lashes that blend seamlessly with your own lashes. Bring the salon home with natural style Kiss True Volume Dreamy Lashes with Revolutionary Kiss Tapered End Lash Technology that delivers real-like lashes that blend seamlessly with your own lashes. Bring the salon home with Kiss True Volume Posh Lashes with Revolutionary Kiss Tapered End Lash Technology that delivers real-like lashes that blend seamlessly with your own lashes. 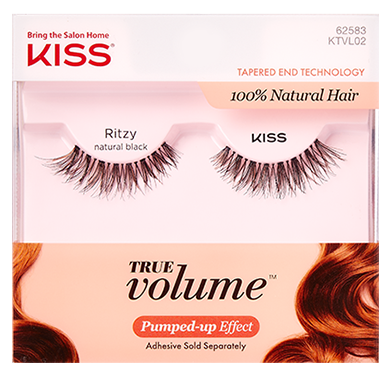 Bring the salon home with Kiss True Volume Ritzy Lashes (KTVL02) with Revolutionary Kiss Tapered End Lash Technology that delivers real-like lashes that blend seamlessly with your own lashes. Please note KISS True Volume Lashes RITZY is currently out of stock; Item will be available again shortly. Bring the salon home with full traditional style Kiss True Volume Spicy Lashes with Revolutionary Kiss Tapered End Lash Technology that delivers real-like lashes that blend seamlessly with your own lashes.